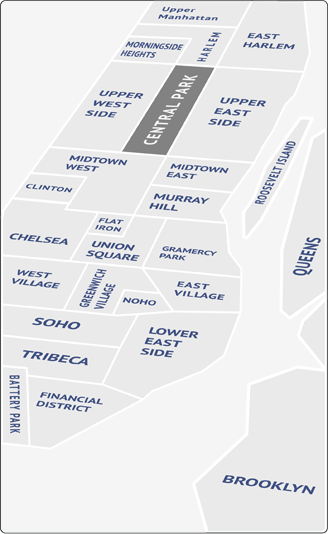 The East Village extends from Houston Street north to 14th Street, and Lafayette Street east to the East River. Once dominated by squatters, punks, hippies and bikers, the East Village used to be a somewhat sketchy neighborhood. But the influences of New York University (NYU) and general surge in Manhattan incomes have transformed this neighborhood into a welcome home for professionals, artists and students. In the last decade, the East Village has seen the opening of hundreds of one of a kind boutiques, art galleries, bars and restaurants. Still, the area retains much of its original seedy charm, with St. Mark’s Place still going strong. Most of the available apartments are in pre-war walk-up buildings, many of which are now refurbished. But there several new residential buildings, including the first to be pre-wired for high speed Internet access (the Info Building at 3rd Street and Avenue A). What some of the older places lack in size is more than made up for in charm. The East Village is home to a huge variety of restaurants, in terms of both ethnicity and price. About a dozen Indian restaurants are packed into the Little India, the block of East 6th Street between 1st and 2nd Avenues. Veselka, a large, all-night diner, is one of the most visible reminders of the East Village’s century-old Ukrainian population. And hip, highly-rated places like Frank, an Italian on 2nd Avenue, seem to open almost every week. You could spend years exploring the East Village’s watering holes. From dive bars to chic clubs, it’s a weekend destination for residents of other Manhattan neighborhoods. It’s also home to dozens of small theaters, especially in the area of Bowery. And beyond the usual multiplexes, the neighborhood has the Sunshine, a Houston Street movie house with foreign and art films and very comfy chairs. Tompkins Square Park used to be considered the center of all that was wrong with the East Village. But after 1991, when the homeless shantytown was razed, the park was transformed. It now boasts two dog runs, tree-lined paths, a weekend farmer’s market and outdoor theater in the summer. Up until a few years ago, only the brave ventured east of Tompkins Square Park, into Alphabet City. As the reclamation of this neighborhood continues, though, more and more residents are moving to Avenues A, B, C and even D. And, of course, new businesses are following, too.